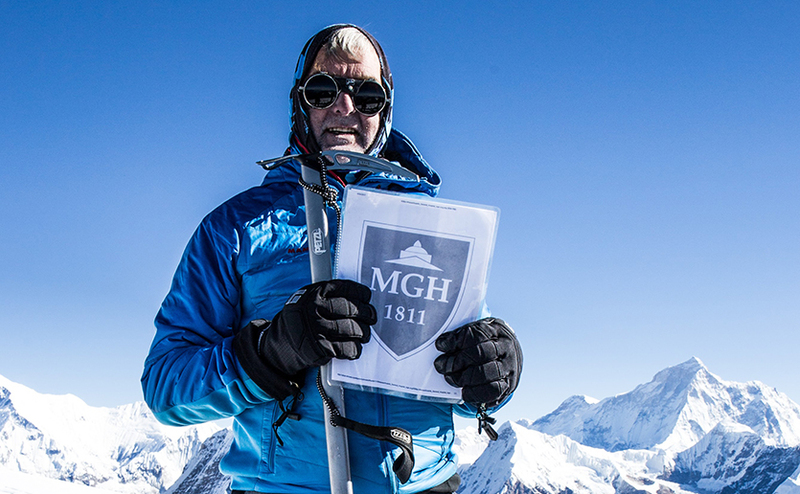 Andy Lindsay flies a flag for Mass General at the summit of Mera Peak in the Himalayas. Empowered by an effective targeted therapy provided by Massachusetts General Hospital, a man with advanced lung cancer heads high into the Himalayas. Andy Lindsay has always set his sights high. But the experienced mountain adventurer thought lung cancer might have ended his climbing days until a targeted therapy from Massachusetts General Hospital Cancer Center empowered him to hike into the world’s highest mountain range. Jan and Andy Lindsay trekking to Mera Peak in Nepal. The Mass General Cancer Center is a world leader in personalized cancer medicine. It offers access to the leading clinical trials for therapies that target specific genetic mutations that allow cancer cells to multiply. The Cancer Center’s caregivers also stay focused on another crucial goal: helping every patient get the most out of life. For Andy, 61, it was climbing Mera Peak, a 21,247-foot mountain with a view of Mount Everest. Hiking into the thin air of the Himalayas, where oxygen is scarce, may seem a surprising choice for a man with stage IV lung cancer. But it made sense to Andy, who has never smoked and is a lifelong adventurer. His wife, Jan Lindsay, a school nurse, often accompanies him. Four years ago, Andy’s adventures had come to an abrupt halt. After returning from a helicopter ski trip in British Columbia, he felt an unusual shortness of breath. The fit-as-a-fiddle athlete soon had to pause in mid-sentence simply to breathe. As his health declined, he took the painful step of asking friends to stop including him in their adventure plans. “I knew I couldn’t go,” Andy says. Testing revealed he had non-small cell lung cancer with EGFR mutation, an aggressive disease seen mainly in people like Andy who have never smoked. He started treatment with one targeted drug therapy. It helped for nine months until his cancer cells mutated and developed resistance to it. While he was searching for a new, more effective treatment, his daughter-in-law, Ashleigh Lindsay, suggested he see the EGFR cancer experts at the Mass General Cancer Center, where she was working as part of her nursing training. Andy made an appointment with two of the center’s oncologists, Lecia Sequist, MD, and Dr. Piotrowska. Drs. Sequist and Piotrowska offered Andy a newer drug that targets the mutated, drug-resistant cells. He enrolled in a clinical trial, becoming one of a small number of patients nationwide taking a new targeted therapy for EGFR cancer. When Andy and Jan heard friends were planning to climb to Mera Peak in October, they jumped at the chance to join them. Andy’s fitness, experience and the success of the new targeted therapy drug all pointed toward giving him the green light. “To be honest, when he first told me, I cringed to think of all the things that could go wrong,” Dr. Piotrowska recalls. But Andy’s fitness, experience and the success of the new targeted therapy drug all pointed toward giving him the green light. Plus Jan, a nurse, would be with him. Andy and Jan kept their expectations in check. “We decided that just going on the trip was a win,” he says. “I didn’t have to get to the top.” And they set up a fundraising Web page for lung cancer research. In Nepal, they followed the popular trekking route toward the base of Mera Peak. By the time they left the last small village behind at around 16,000 feet, altitude sickness had kicked in for Jan. She was plagued with severe headaches and nausea. When she reached base camp at 18,000 feet, Jan turned her husband over to his experienced climbing companions, including one doctor, and headed to lower altitude to recover. Andy trekked on. On the final day of the summit ascent, he emerged from his tent at 3 a.m. into a dark, blasting cold. Stars gleamed through the thin atmosphere. The guide roped Andy into the first group heading up the mountain. Andy Lindsay pauses on his trek to Mera Peak. As Andy tells it, it was so cold his companions wanted to run up the mountain. But they were roped to Andy, whose energy was ebbing. “I was like a like a donkey they were roped to. I would stop to catch my breath and make them all stop.” His fellow trekkers, who knew about his condition, waited patiently in the howling cold. Andy put one foot in front of the other. The sun came up. “I looked up and saw a ray of red on the horizon that went all the way around the sky,” he says with a sweep of his arm. By mid-morning, after a final steep climb, they reached the summit with a view of Mount Everest. There, at the peak of his incredible journey, Andy unfurled a handmade flag with the letters “MGH” emblazoned on it. “There is an old climbing tradition that you fly your flag at the summit,” says Andy who, with his wife, friends and family, continues to carry the flag forward toward a cure for lung cancer. To support Dr. Piotrowska’s research into EGFR lung cancer, visit Andy’s fundraising page. For more information, please contact us. Join Andy and Jan Lindsay in support of research for Lung Cancer at Massachusetts General Hospital.